The oil giant has long said it has no responsibility for atrocities committed by the government soldiers it hired to protect its plant in Indonesia. Now the issue could be headed to the Supreme Court. Update: The Supreme Court has ruled that foreign plaintiffs in most cases do not have standing to sue U.S. corporations over human-rights violations in American courts. The decision (PDF) came in a case, Kiobel v. Royal Dutch Petroleum, involving allegations that Shell was complicit in human-rights abuses in Nigeria. It is expected that other companies will move for dismissal of similar suits over human-rights violations overseas, including the Exxon case we investigate in this story. This was the Aceh Province, Sumatra, Indonesia, at the height of a bloody civil war. Such accounts were commonplace. But in this case, according to the complaint, the man’s captors were not just any soldiers. They were “ExxonMobil security personnel.” And now, more than a decade later, ExxonMobil has been ordered to stand trial in a human rights lawsuit. In June 2001, John Doe III and 10 other civilian neighbors of ExxonMobil’s Arun natural gas facility filed a lawsuit against ExxonMobil in federal district court in Washington, DC. In John Doe v. ExxonMobil, (PDF) the villagers charge the company with complicity in torture, arbitrary detention, and extrajudicial killings allegedly committed by Indonesian soldiers it hired to provide security. ExxonMobil has steadfastly maintained its innocence in the case. But in a 2008 ruling (PDF), federal district court judge Louis Oberdorfer ordered Exxon to face trial. “A reasonable finder of fact,” the judge wrote, citing internal correspondence from Exxon and its Indonesian subsidiary, EMOI, “could conclude that the paid security forces committed the alleged torts and that EMOI and Exxon Mobil are liable.” Exxon appealed, but a federal circuit court panel upheld that part of the ruling in July 2011. The fate of the ExxonMobil case now rests in the hands of the US Supreme Court. On October 1, the court heard arguments in a similar, better-known case, Kiobel v. Royal Dutch Petroleum (Shell)—and it’s that case that may determine whether the Acehnese villagers ever get their day in federal court. Like John Doe v. ExxonMobil, the Kiobel case relies on an 18th-century statute called the Alien Tort Claims Act. The Nigerian plaintiffs say it gives citizens outside the United States the right to sue any corporation with a US presence for aiding and abetting human rights abuses—such as the Nigerian government’s alleged extrajudicial killings of Ogoni protester Ken Saro-Wiwa and Barinem Kiobel. Like ExxonMobil, Shell says the Alien Tort Statute does not apply to cases like this: that only individuals—and not corporations—can be held liable for human rights violations on foreign soil. Expected as early as December, the court’s ruling will almost certainly set a major precedent—either allowing people around the world to continue suing companies in US federal court for abuses like slave labor, extrajudicial killings, and torture, or shutting them out for good. More than a dozen Alien Tort cases involving hundreds of plaintiffs are riding on the decision. They target corporations from Chevron to Chiquita. But proponents of the Alien Tort statute say that if a corporation doing business in this country does indeed aid and abet abuses abroad, it belongs in US federal court. They point out that courts in the host countries often cannot adequately handle such cases, leaving plaintiffs no other forum. On the morning of March 21, 2001, a doorbell rang on the ninth floor of a run-down building in Washington, DC, at the International Labor Rights Forum, an advocacy group for workers affected by economic globalism. At the dingy pressed-wood door a young foreigner appeared speaking no English, only the Indonesian language of Bahasa. His name was Mohammed Saleh, and he was a student activist representing a small human rights group in Aceh, Indonesia. The Indonesian government had recently imprisoned the group’s leader, Muhammad Nazar, for advocating a referendum on Aceh independence. So Nazar arranged to send Saleh to Washington, DC, to tell Americans about Aceh’s crisis. One of the Forum’s staffers, Bama Athreya, who happened to have learned Bahasa while working in Jakarta, welcomed the visitor. She had met him earlier and he’d told her the stories relayed by villagers living near ExxonMobil—people like John Doe III. The two of them seized on an idea: Burmese villagers had recently used US courts to sue an oil company, UNOCAL, over complicity in slave labor. The case was being colitigated by Athreya’s boss at the International Labor Rights Forum, Terry Collingsworth. Could something like that work in Aceh? Up on the 9th floor, Athreya introduced Saleh to Collingsworth. The son of a shop steward at a copper mill in Cleveland and a former machine operator at the mill, Collingsworth grew up wanting to be a labor lawyer. In law school he developed an interest in human-rights issues, and at 32, cofounded the International Labor Rights Forum. The UNOCAL case was one of organization’s first major cases. When Saleh arrived, Collingsworth took him to a conference room. With Athreya translating, he listened to the young man’s account of the atrocities in Aceh, and the alleged role of ExxonMobil’s security force. Within a week, he was on a plane to Indonesia. Located on the northern tip of the island of Sumatra, one of the larger islands in the archipelago of Indonesia, Aceh is a largely undeveloped tropical province known for its rice fields, palm plantations, and the devastating 2004 tsunami. But Aceh is also a center of deep Islamic faith and fierce independence. For more than 400 years the area was an Islamic sultanate with deep cultural and trading ties to India and the Middle East. The Dutch tried to colonize it in the 1870s; Japanese occupiers came in during World War II. But the recent tensions result from a historical rivalry with the neighboring island of Java. When Indonesia became a nation in 1949, Java rose in status, with its largest city, Jakarta, as the capital. 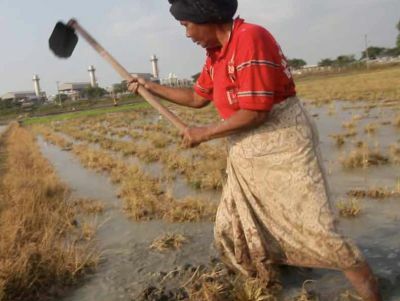 A rice farmer hoes her crop in front of the ExxonMobil facility in Lhoksukon, Aceh. Emily JohnsonIndonesia’s nationalist leaders dangled promises of autonomy to enlist Aceh’s cooperation, but those promises went nowhere. The Acehnese chafed under the Jakarta-based regime—especially under Suharto, Indonesia’s second president, who took office in 1968. Shortly after Suharto gained control, Mobil Oil began drilling for natural gas in Sumatra and in 1971 it discovered an enormous natural gas field in Aceh. Mobil contracted with Suharto’s government to extract gas from the field, forming a joint venture with the state petroleum company to process the gas. Under terms of the deal, the Indonesian government owned 55 percent of the facility, known as Arun, ExxonMobil 35 percent, and a Japanese company 10 percent. By the late 1970s, the Arun project was producing a dizzying volume of liquid natural gas. The arrangement began to generate hundreds of millions of dollars in profits for Mobil and its Indonesian state-owned partner, Pertamina. Little of that money was invested back into the region. By the mid-’70s, a movement for Acehnese independence known as GAM—Geraken Aceh Merdeka, or Free Aceh Movement—emerged, and its leaders demanded that more of Mobil’s revenue go to poverty-stricken Aceh. The demand did not go over well in Jakarta. Crushed and forced into hiding, GAM turned to Libya for training in the late 1980s. The Indonesian military, later known as TNI, responded with a vicious crackdown beginning in 1989. Over the next decade the military presence made it difficult to monitor and record abuses, although the US State Department was reporting an increasingly alarming tally in the run-up to Suharto’s resignation in 1998. 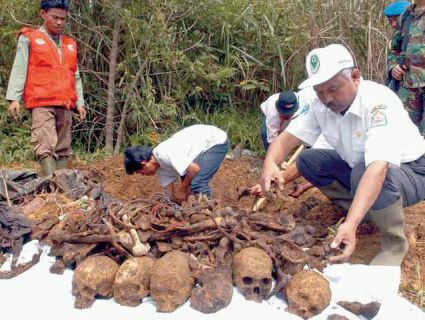 During a brief respite following the resignation, researchers for human rights NGOs and the Indonesian government documented a decade of atrocities committed against GAM and its perceived supporters. But from 1999 to 2004 the repression returned, involving far more troops. While GAM itself has also been accused of intimidation, extortion, and human rights abuses, it is widely reported that the Indonesian military committed the majority of violence against civilians, mostly poor farmers like John Doe III. But by 2000, the jewel was under threat. GAM and other groups began abducting and attacking ExxonMobil employees. According to the lawsuit, ExxonMobil paid Indonesia’s soldiers $500,000 a month to protect the plant that year. But the violence continued, and ExxonMobil grew increasingly concerned. Then came the 2004 tsunami, which took more than 100,000 lives and prompted the warring parties to agree on Aceh’s autonomy and sign the 1995 Helsinki peace accord. The pact set up a human rights court, but Indonesian legislators explicitly forbade it from considering human rights allegations before 2006. So at the time, only Collingsworth’s plaintiffs were left to redress the atrocities of Aceh’s civil war. Collingsworth’s plane landed in the city of Banda Aceh in late March of 2001, just as ExxonMobil was temporarily closing the Arun facility following a rise in attacks on the company’s employees and property. The Indonesian military was preparing to send 3,000 additional troops to the area, and a crackdown on civilians was going on unabated. Collingsworth had arrived in a war zone. He immediately went to the prison to see Nazar, an Amnesty International prisoner of conscience. He found him on a bench in the prison courtyard. The local guards, who seemed sympathize with his cause, stood respectfully by. Through a translator, Nazar grilled the visitor: Would the chances of succeeding with the lawsuit justify the high risks? How could Collingsworth avoid violent retaliation against Nazar’s staff and the plaintiffs? Collingsworth answered questions for several hours, and Nazar finally gestured approval to the translator, saying Collingsworth should be taken to meet the alleged victims. Outside the Exxon facility in Lhoksukon, Aceh. 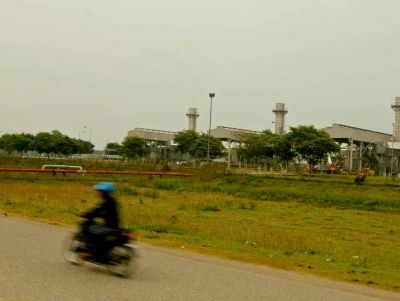 Emily JohnsonOn the ride southbound to ExxonMobil’s sprawling facility in Lhokseumawe, Collingsworth and his fellow passengers passed a series of armed military checkpoints, he says. The two Acehnese on the trip—the translator and a Nazar associate—told the soldiers they were showing their visitors around and taking them to the beach. 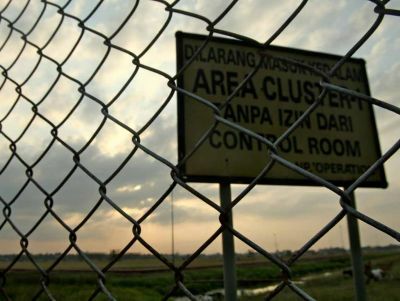 They avoided the area immediately around the Arun facility, where Indonesian troops guarded the main gas pipeline and sprawling gas complex. Instead, the group convened a considerable distance away in a quiet gazebo in a public park. They wanted the “safety of sunshine,” Collingsworth says—an open-air meeting to disarm suspicion and reduce chances of a sneak attack, especially with witnesses present. In the course of eight hours, Collingsworth heard from about 50 people. Determining who could remain safe from reprisals and who had suffered explicitly from ExxonMobil’s unit specifically, he came up with a list of 11 plaintiffs. Two months later, on June 19, 2001, Collingsworth filed the suit in district court in Washington, DC. “ExxonMobil security personnel” accosted a man traveling between villages, beat him, handcuffed him, accused him of membership in GAM, ignored his denial, and “took him to Post A-13 on ExxonMobil’s property,” where they threw him to the ground, wielded a knife, and “carved the letters ‘GAM’ into his back…regularly torturing him” for several more weeks. In an email, ExxonMobil’s Eglinton declined to answer additional questions about ExxonMobil’s view of ATS suits in general, its method of dealing with security challenges abroad. He also declined to comment on the specifics of the Aceh lawsuit. The judge wrote that the evidence did indicate that company at the very least should have known about the Indonesian soldiers’ tendencies. While documents in the case are sealed, Judge Oberdorfer’s 2008 court ruling quotes the material—including ExxonMobil’s internal correspondence. Oberdorfer cited no evidence that ExxonMobil knew about any specific incident alleged in the suit, much less condoned or authorized them. But he wrote that the evidence did indicate that company at the very least should have known about the Indonesian soldiers’ tendencies. Also in the PRI interview, Weinstein said that “the government has responsibility for security,” underscoring ExxonMobil’s argument that Indonesia required the company to hire the troops. Oberdorfer pointed to evidence that ExxonMobil initiated that request. The judge found that this relationship is suggested throughout the materials. He quotes one internal email stating “it(‘)s not going to be easy managing 900 troops in our operational area.” Another official deposed in the case said security managers at the subsidiary often went “up the chain and request(ed) additional corporate kinds of support” from ExxonMobil officials in the United States. In short, the judge found sufficient evidence of the company’s control to permit a jury to consider its liability. While ExxonMobil doesn’t disclose its legal budget, the company maintains a sizable counsel staff and retains some of the most powerful law firms in the country. In one of the most famous lawsuits against it, about the 1989 Valdez spill, the company was ordered to pay $5 billion in punitive damages—but in five appeals over a dozen years, going all the way to the Supreme Court, it winnowed that amount to $500 million. Few lawsuits are significant enough to make a dent in the company’s financial projections. In SEC filings from 2001 to 2011, a voluntary list of potential liabilities to inform investors, Exxon listed only 28 lawsuits against it. The Aceh suit is not included. Collingsworth’s case has attracted the support of like-minded NGO lawyers and pro bono firms, most notably the acclaimed human rights litigator Agnizeszka Fryszman of the DC firm Millstein & Cohen, now co-counsel. But at least in terms of resources, the odds are still in ExxonMobil’s favor: two NGO lawyers working on contingency for a dozen poor villagers and their families against a corporate in-house counsel office supplemented by three outside law firms. Back in Aceh, the identity of the plaintiffs remains closely guarded. The lawyers have fought to ensure that any ExxonMobil cross-examination would protect their clients’ anonymity, and have restricted media access to their clients for fear of reprisal. But the delays have already taken their toll. A few years into the court proceedings, Collingsworth reported that unknown assailants had killed two of his plaintiffs. The earliest a trial could take place is 2013—a full dozen years after the alleged events. In the jargon of the courts, ExxonMobil’s case is “stayed” until the US Supreme Court rules on Kiobel v. Shell—in legal limbo. During Monday’s hearing, lawyers addressed a basic question about one of the nation’s oldest laws. When Congress enacted the Alien Tort Claims Act of 1789, occasionally violent US-based privateers were plying the seas in pursuit of black-market riches. The Alien Tort act gave foreign-born nationals the chance to file claims against the privateers in US federal court, which was deemed fairer and less parochial than regional or local courts. Dusted off by civil rights activists in the 1970s, the Alien Tort statute recently has come to apply to any corporations with a presence in the United States. In a series of precedents over recent decades—including in the ExxonMobil case—lower courts have firmly established this principle. According to the Product Liability Advisory Council, plaintiffs have filed almost 250 Alien Tort cases over this period—nearly half of them against at least one corporate defendant. Courts dismissed many of the cases, but three have gone to trial, one resulting in a verdict for the plaintiffs, and a few others have settled. And now the trickle of cases shows signs of turning into a flood: Of the 120 cases against corporations, fully half were filed since 2008. The Kiobel decision could change all that: While in previous cases the right of plaintiffs to sue in US federal courts for abuses committed overseas had gone unquestioned, the 2nd US Circuit Court of Appeals in Kiobel ruled that Shell was immune: that liability for human rights violations applies only to natural persons. This is the issue that dominated the first round of oral Kiobel arguments before the Supreme Court in February. Monday’s arguments presented a new wrinkle. While exploring the United States’ role as “the court of last resort” for human rights abuses abroad, the court addressed whether the Alien Tort Statute applies to a foreign entity like Dutch/UK-based Shell, which also has operations in the United States. And while it’s risky business to predict the court’s intentions, the line of questioning seemed to hint at a compromise, according to knowledgeable observers from both sides: Aliens must first try to sue either in the country where the abuses took place, or in the country in which the corporation is based—and then demonstrate it was impossible to do either. Such ruling could dismiss Kiobel while leaving the ExxonMobil case intact—that is, if the court doesn’t rule for corporate immunity across the board. In their private deliberations on corporate immunity, the justices will be facing a judicial dilemma of their own making. They ruled in the 2010 Citizens United case that corporations have the rights of natural persons—in particular, the right of free speech in the form of campaign contributions. As the Supreme Court grapples with its decision, ExxonMobil is in the process of pulling out of Aceh, abandoning the dwindling reserves of the Arun gas facility. But losing or settling the case wouldn’t noticeably move ExxonMobil’s considerable bottom line. Of more concern might be the negative fallout that comes from being publicly associated with atrocities. The report was produced in association with the media NGO Project Word (projectword.org), a project of the Tides Center, with reporting assistance from Hannah Rappleye and Lisa Riordan Seville. For more on this story, visit projectword.org/aceh. This reporting was made possible by grants from the Fund for Investigative Journalism and the Mailman Foundation.